Kids love singing jump rope songs while they jump the afternoon away! Classic songs and chants add a fun element to this popular activity. Singing jump rope songs can help kids keep their rhythm while they jump. 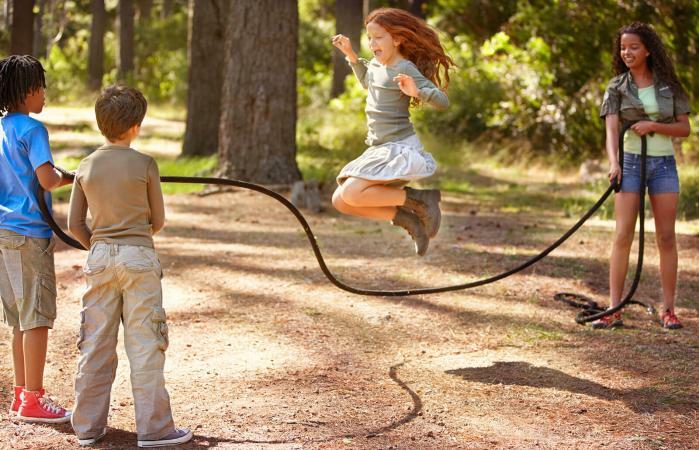 When it comes to workouts for kids, it's hard to beat jump rope exercise. In addition to its fitness and health benefits, jumping or skipping rope has always been a fun way to spend an afternoon, either alone or with friends. Jumping rope has been around for many years, and using songs or chants may date back to the 17th century. Jump rope songs gained incredible popularity in the US during the 1940s and 1950s and have been passed down from one generation to the next. In fact, chances are your grandchildren will be singing a version of the songs you chanted as a kid. 1, 2, 3 . . . . .
Teddy Bear, Teddy Bear, please skiddoo! If you want to substitute some more modern themes and ideas into jump rope chants or songs, you can easily do so. These examples use the traditional style of chanting found in most jump rope songs but offer a few elements that are more contemporary. of my cell phone ring. did it ring, ring, ring? did it ping, ping, ping? root beer and ice cream, please! And how does she do her hair? If you want to come up with something a little more creative, you can try to come up with your own jump rope songs and chants, too. Think of things that will promote counting or include lists to help keep the jumping rhythm. Include some simple rhyming words and phrases to keep the flow of your song, and add in favorite items, things to do or even places to go. Another way you could come up with original songs to jump to is by coming up with new words for songs you already know. These work best if they have a steady or repeated rhythm. Once you've learned how to jump rope, jumping to classic songs and chants makes it even more fun, especially if you're doing it with friends. Whether you go with a traditional song from decades ago or come up with a new twist in the classic style on your own, it will add laughter and memories. You may even want to learn jump rope tricks!